Recently I found mini storage boxes at The Dollar Tree and it gave me an idea. They were the perfect size for treat boxes. They come in packages of 10, so each box is only .10 each. 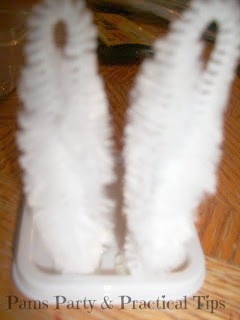 At Michaels I found white chenille stems on clearance for only .49, which were just right to use for bunny ears. While there I also picked up a bag of mini white pom poms. I had google eyes at home, but if needed they are also available at the dollar store and craft store. You need one chenille stem per bunny. 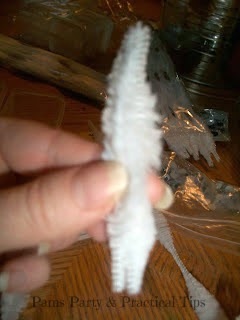 Cut the stem in half and then fold each half to make the bunny ear. 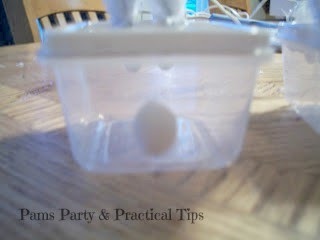 Make a little twist on the end to secure it and bend slightly, so that it will stand up when you hot glue it to the lid. Draw on the nose and smile with a marker. I used Bic Mark It. My daughter thought it needed feet, so we also glued on 4 poms on the bottom of the container. 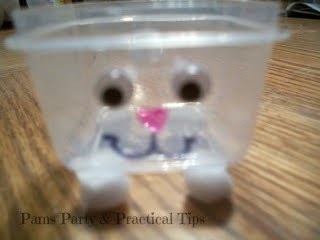 If adding candy, make sure to wash the containers before making the bunny. 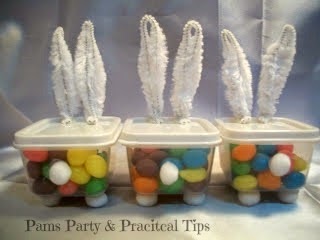 We used jelly beans in our treat boxes. 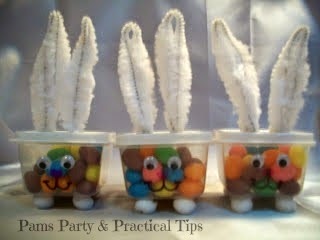 These are perfect for class parties, Easter get togethers, egg hunts and more . Not only are they easy to make, but inexpensive as well. Awww how sweet! Thanks for sharing ~ come by and say hi sometime! I LOVE this idea! Too cute! Thank You!.. Heading over there now. these are so so cute. they make me feel like a kid again! Ah!!! Cute overload!!! ;-) Thanks for linking up to my Marvelous Mess party!!! These are really cute. Perfect for my sunday school class which is all boys. What an absolutely cute treat container for kids school parties!!!! Super cute! I hope you'll stop by the Pretty Packages Party and share them. Those are adorable, Pam!! I love them! Those are so sweet!! I'd love to have you share them at my For the Kids link party!!! Stop by and join the fun!! Such a cute idea! Love the little bunny faces! I'm sharing this on my facebook page as well! Thanks for linking up! How cute are those?! Great idea! 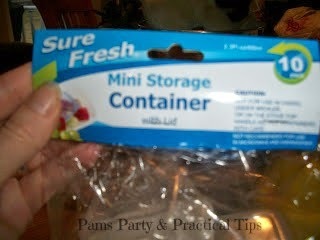 Thanks so much for linking up to my Catch a Glimpse party! Oh my goodness! CUTE, CUTE, CUTE! Stopping by from Sun Scholars! Those are really cute! Perfect bunny ears! That is a fun idea! I think my son would love these. What kid or adult wouldn't like this treat! So creative and cute. Great job! Thanks so much for linking up to Terrific Under Ten!